It is a big weekend for Loudoun’s musical, nonprofit and arts communities. On Saturday, the BENEFIT concert will rock the Village at Leesburg and Arts in the Alley will be held in the downtown historic district. Both annual events are in their second year and organizers are hoping to build in the foundations they set in 2017. BENEFIT is a coalition of Loudoun musicians and community leaders that formed to put the spotlight on the important work of the county’s nonprofit organizations and raise money to support their efforts. And they do that with a free concert. From 2 to 8 p.m., five bands—and some of the county’s up and coming artists will perform—on two stages along the Village’s main boulevard. The lineup includes Big Bad Juju, Frayed Knots, John Schreiner, Julie Says No,The Voodoo Blues, and Todd Wright and Tommy Gann. Legendary Washington DC dee-jay, author, and host of Music Planet Radio Cerphe Colwell will emcee the event. Music is the attraction, but the work of volunteers on display in the Nonprofit Village is the focus of Saturday’s BENEFIT Festival. There also will be displays by dozens of nonprofits where representatives will be on hand to tell visitors about their missions, discuss volunteer opportunities, and even collect donations. 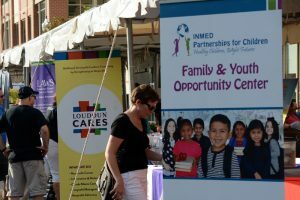 Last year’s event was followed by BENEFIT awarding $5,000 in grants to five nonprofits. How does a free concert generate grant funds? The organizers have developed a BENEFIT Bucks program whereby concert goers can purchase the coupons and use them as raffle tickets at the nonprofit tents or to make purchases from some of the participating merchants surrounding the concert area. After the event, the nonprofit representatives return the coupons and are paid $1 for each one. Another 50 cents from the sale of each buck goes into the BENEFIT Fund, which is administered by the Community Foundation for Loudoun and Northern Fauquier Counties. That money, along with proceeds from concert T-shirt sales, will be distributed in grants. For more information, go to benefit.live. The breadth of Loudoun’s arts community will be on full display from 10 a.m. to 6 p.m. Saturday during the second Arts in the Alley celebration. 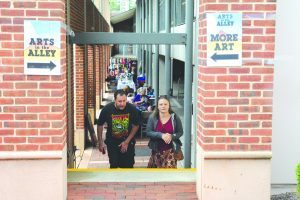 The event, centered around the alley next to the Town Hall parking garage and throughout Town Hall campus, features a slew of visual artists selling their work, along with demonstrations from ceramicists, sketch artists and textile artists. The program is organized by Friends of Leesburg Public Arts and designed to be a family arts day. Art of all kinds will be on display throughout the Leesburg Town Hall campus on Saturday. 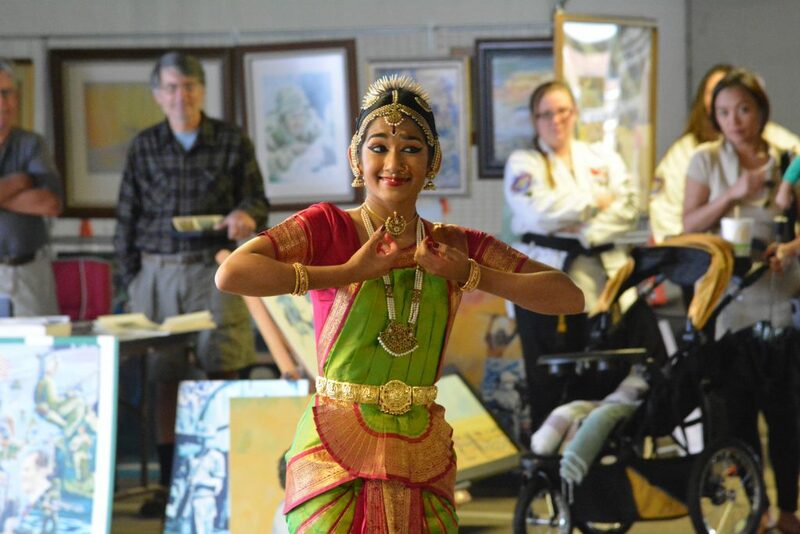 The day also offers a full schedule of performances at the Town Green Stage, including the Loudoun Chorale, Last Ham Standing comedy improv and last year’s crowd favorite, the Bharatanatyam Dancers Indian classical dance group. A second stage for solo singers and songwriters will be set up behind Kings Court Tavern. For families, the event includes kid-focused puppet shows from Blue Sky Puppets and a Paint the Mayor event for children with Leesburg Mayor Kelly Burk at 11:30 a.m. The Bharatanatyam Dancers Indian classical dance group was a crowd favorite during last year’s inaugural Arts in the Alley event. They return to town on Saturday. This year’s festival also features the Windows on Leesburg Arts auction, a FOLPA fundraiser featuring hand-painted vintage windows and shutters painted by top local artists and community groups. The works have been on display around town during the past month and can now move to your home or business. The works will be auctioned starting at 4 p.m. at the Art Sweet Art gallery, at 2B Loudoun St. SW.
For more information and a performance schedule, go to leesburgpublicarts.org.